Designed for base preparation, compaction around footings and foundations and backfilling of trenches, the Bomag BMP8500 multi-purpose compactor boasts center-point articulated steering for enhanced maneuverability in confined areas. It is controlled via a dual function radio/cable remote control for reliable, safe operation from outside the trench. Featuring Bomag's BOSS (Bomag operator safety system), the machine's travel system automatically stops if the operator enters into close proximity of the machine, elevating operating safety to a whole new level, according to the manufacturer. 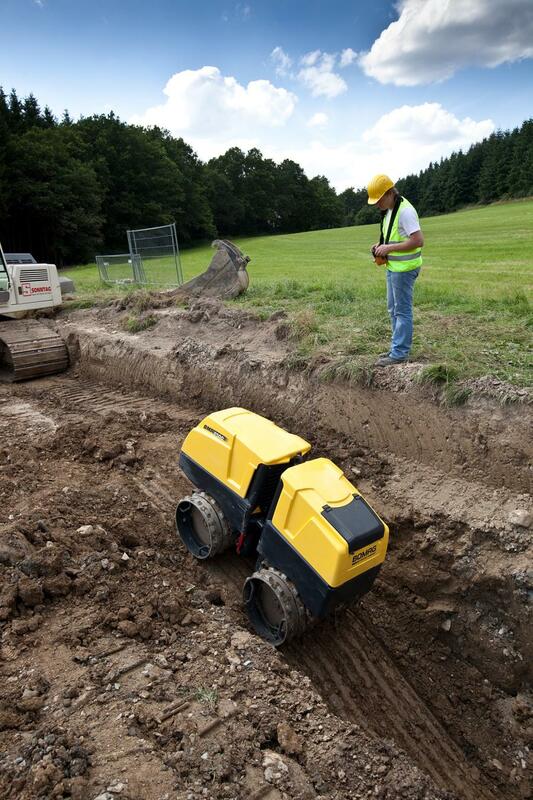 Built with a narrow machine body, the BMP8500 can fit inside trenches as small as 24 in. (61 cm) wide. Segmented compactor drums come in standard 24- and 33.5-in. (61 and 850 cm) widths with 1-in. (25.5 cm) padfoot height for quick compaction of clays and cohesive soils. Within minutes the operator can switch between drum widths due to the bolt-on extension segment design. The Bomag BMP8500 is powered by a fuel-efficient Tier IV Kubota 19.4-hp (14.5 kW) water-cooled diesel engine. Offering the Bomag exclusive Ecomode to lower operating costs, the compactor automatically reduces to idle within a few seconds if the remote control is not activated. With its 3,517-lb. (1,595 kg) operating weight, the multi-purpose compactor generates 8,000 and 16,000 lb. (36 and 72 kN) of centrifugal force with its dual amplitudes to tailor compaction forces to lift thickness. Bomag's optional Economizer compaction measuring system is integrated into the hood of the BMP8500, so it's visible to the operator and well protected. Economizer automatically determines compaction progress to optimize material density, prevent over compaction and allow the operator to identify weak spots in the subsoil. Economizer eliminates unnecessary passes for a time savings of up to 25 percent, according to the manufacturer. The BMP8500 compactor includes dual, wide-opening hoods for unimpeded access to the engine and machine components to simplify servicing. The machine has no grease points, shortening daily maintenance practices and increasing machine longevity. It is covered by Bomag's 3-2-1 warranty, where the exciter gear, including vibration pump and motor, is covered for 3 years, the engine for 2 years and a full 1-year standard machine warranty.